As a mama to five kiddos, the youngest being twins who breastfeed every four hours, I am fully aware of the importance of having power snacks that I can grab on the go! And, the more I visit with fellow moms, I have learned that I am not alone! Getting the nutrients we need in the midst of our busy days, can often be a challenge. I created these power protein balls with the busy mama, especially the breastfeeding mama, in mind!! They are full of nutrient-dense ingredients, are great for a quick and satisfying boost of energy, and can aid in milk-production. Plus, they are naturally sweetened with raw honey. Now, before going any further, I believe it is important to briefly address why sometimes peanuts (which are actually a legume, not a nut) are avoided. Certainly, they should be avoided if one has an allergy or sensitivity. In that case, swapping out peanut butter for another nut butter usually works out wonderfully in a recipe. In the recipe below, another great alternative to the peanut butter would be to use almond butter or cashew butter. It really is up to you! Still, if you are asking the question regarding whether to incorporate peanuts in your diet, I have found Dr. Axe to provide a solid answer in his post, “Peanut Butter Nutrition Facts: Is It Bad For You?” In this post, he explains why some peanut butter is unhealthy for you (higher in mold content and omega-6 fatty acids). Yet, he also goes on to share how to incorporate peanut butter in a way that can actually be beneficial for your health (choosing one that is organic and made from Valencia peanuts, and including foods containing omega-3’s into your diet.) I encourage you to check out his article, as he does a great job at simplifying some important information regarding peanuts. 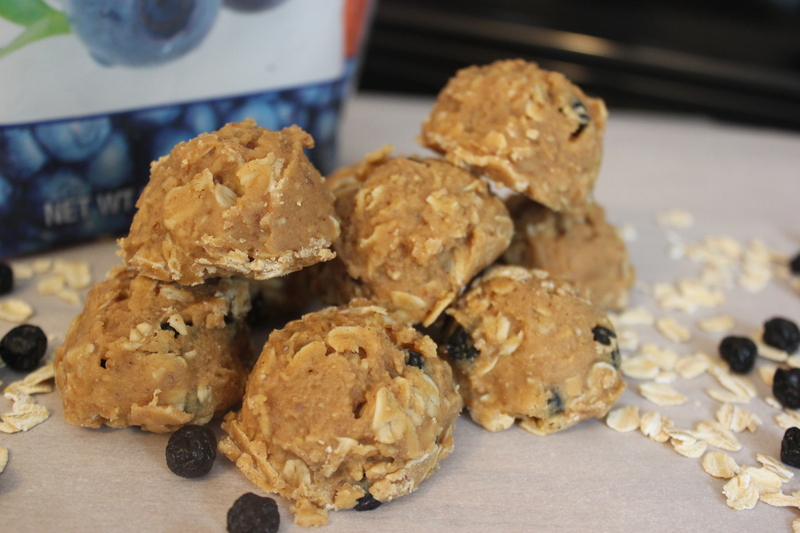 All that being said, whether you choose to use use peanut butter or another nut butter, I have included nutrient-dense, balanced ingredients in this recipe so you can be confident that you are consuming a great tasting and guilt-free snack. 🙂 Plus they are wonderful for the kiddos as well! Enjoy!! 1) Line a cookie sheet with parchment paper and set aside. 2) In a large bowl, gently stir together the oats, raisins (or dried fruit of your choice), ground flax, protein powder, and salt. Set aside. 3) In a medium saucepan, gently stir together the peanut butter, raw honey, and grass-fed butter on low heat. Stir continually to prevent burning. Once the mixture is combined and the butter is melted, remove the saucepan from the heat. You want your peanut butter, honey, and butter to be warm, not hot. Stir in the vanilla extract. 4) Add your liquid mixture to the dry ingredients, and gently stir with a spatula until combined. Let it set for 5 minutes. If your mixture seems wet, add 1-2 tablespoons more protein powder, stirring between each tablespoon addition. 5) Using a cookie scoop, form your protein balls and place on the parchment lined cookie sheet. Place the cookie sheet in your freezer until the balls are hardened, about 30 minutes. Store in an airtight container in the refrigerator.